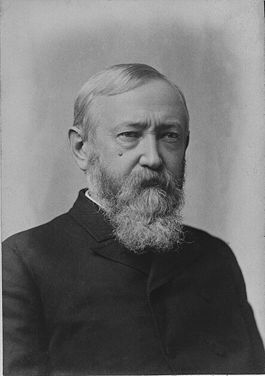 Benjamin Harrison (20 August 1833 – 13 March 1901) was the twenty-third president of the United States, elected as a Republican in 1888, but defeated by Grover Cleveland in 1892. He was a representative politician of the Gilded Age. Harrison was born in North Bend, Ohio, and grew up on a 600-acre (243-hectare) farm nearby. His father, John Scott Harrison, was a congressman; his grandfather, William Henry Harrison, was ninth president of the United States, but served only 309 days; and his great-grandfather, Benjamin Harrison, signed the Declaration of Independence. In 1852 Harrison was graduated from Miami University in Ohio, and a year later he married Caroline Lavinia Scott, by whom he had two children, Russell and Mary. After reading law in Cincinnati, Harrison moved in 1854 to Indianapolis. There, his rise was slow. In 1860 he was elected reporter of the Indiana Supreme Court. Church affairs and politics always interested Harrison. He was a devout member of the Presbyterian Church and for 40 years served as an elder. He belonged to the pietistic wing that gave heavy support to the Republican party, and to prohibition Harrison himself did not support prohibitiom. In 1854, when the struggle over slavery was at white heat, he joined the newly organized Republican Party. For the next 40 years he loyally supported his party in every campaign and became one of its best speakers. Early in the Civil War, Harrison helped to raise the 70th Indiana Infantry Regiment and became its colonel. After two years of prosaic guard duty in Kentucky and Tennessee, his regiment was attached to General William T. Sherman's army and participated in the Atlanta campaign in 1864. During much of the time Harrison was in command of his brigade and at the close of the war was brevetted a brigadier general and cited for gallantry. Thereafter he was known as General Harrison. In 1865 Harrison returned to the practice of law and was immediately recognized as one of the leading lawyers in Indiana. In 1881 he was admitted to practice before the United States Supreme Court. His income enabled him to build a spacious home in Indianapolis. Harrison preferred to be a United States senator and was easily elected by the state legislature in 1881. As chairman of the committee on territories he sponsored an act granting Alaska civil government and, against Democratic opposition, vainly sought the admission of Washington, Montana, Wyoming, Idaho, North Dakota, and South Dakota as states. He championed the Mississippi River Commission, naval expansion, and the regulation of railroads. s a senator, Harrison supported civil service reform to supplant the traditional spoils system, high protective tariffs to foster industrial development, a strong navy, and regulation of the railroads. He persistently attacked President Grover Cleveland's vetoes of veterans' pension bills. Harrison's popularity with veterans was to be a major factor in winning the presidential nomination in 1888. Although defeated by two votes in the legislature for reelection to the Senate, Harrison loomed as the strongest Republican candidate for president in 1888 and was nominated on the 8th ballot after the New York delegation swung to him. An intensely fought campaign followed, with the tariff as the main issue. Harrison set a precedent by conducting an effective "front porch" campaign, making a large number of short speeches to visiting delegations. His masterful campaign chairman was Philadelphia dry goods merchant John Wanamaker, who perfected the "army style" of 19th century campaigns. Harrison defeated incumbent Grover Cleveland by a vote of 233 to 168 in the electoral college, although Cleveland received 5,537,857 popular votes to Harrison's 5,447,129. Among Harrison's excellent cabinet appointments was Benjamin F. Tracy, secretary of the Navy. Armor-clad ships of the most modern design--fateful for Spain in 1898--were rapidly built and navy yard employees were placed under civil service. John Wanamaker, as postmaster general, inspired his department with a vision of greater service. He advocated the establishment of postal savings banks and the parcel post--ideas that were to be realized two decades later. The appointment of James G. Blaine (the Republican presidential candidate defeated by Cleveland in the 1884 election) as secretary of state was viewed critically by some. Harrison kept in close touch with each department's major programs. He brought two future presidents to Washington: Theodore Roosevelt as civil service commissioner and William Howard Taft as solicitor general. In civil service reform good progress was made, but it was not revolutionary enough to satisfy its proponents. 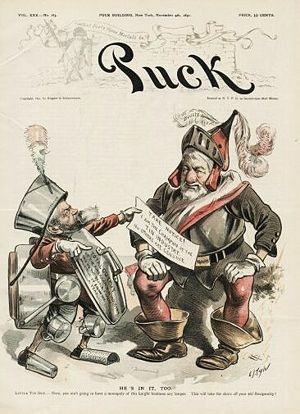 1890 Puck cartoon ridicules President Harrison (who called for a tariff on tin), as a little Tin Man, while Secretary of State Blaine is a larger figure clad in steel armor. Harrison appreciated the new forces which were inevitably sweeping the United States onward into playing a more important part in world affairs. He took great pride in the new navy and the increase of the merchant marine, and watched for opportunities to acquire naval bases. American claims in Samoa were pushed with vigor; annexation of Hawaii was attempted but postponed by Democratic opposition; the purchase of the Danish West Indies was quietly considered, as was the acquisition of the Môle St. Nicolas in Haiti. In the bitter controversy with Chile, during which war was narrowly averted, Harrison insisted on respect for the uniform of the United States. The increasing importance of the United States in world affairs was reflected in the act of Congress in 1893 which raised the rank of the most important diplomatic representatives abroad from minister plenipotentiary to ambassador. During his administration the McKinley Tariff Act with its important reciprocity section, the Sherman Silver Purchase Act, the Sherman Antitrust Act, and the Dependent Pension Act for Civil War veterans were passed. Idaho and Wyoming were admitted as states and the Oklahoma Territory was opened to settlement. The civil rights bill (attacked as a "Force Bill" by Democrats) failed when Republicans from western silverstates traded their votes to get the Sherman Silver Purchase Act. The election of 1890 was a landslide for the Democrats, who campaigned against the high-spending "billion dollar Congress," the high McKinley tariff, and the Republican attacks on foreign language schools in Wisconsin and Illinois. Despite Harrison's icy personality, he won renomination in 1892 by packing the GOP convention with office holders. He was defeated by a landslide by Cleveland in a rematch in 1892. Harrison retired to private law practice. He was selected as senior counselor by Venezuela in its boundary dispute with Great Britain before the Paris Arbitration Tribunal. After the death of his wife he married Mrs. Mary Scott Lord Dimmick in 1896 and by her had one child, Elizabeth. In his later years Harrison often spoke and wrote effectively on the important economic and political questions of the day. His popular book, This Country of Ours, describing the government of the United States, had a wide sale and influence. Gibbons, H. A. John Wanamaker, 2 vols. (1926), covers the 1888 campaign. This page was last modified 20:09, 24 September 2013.